Learn how to use a free cloning software to clone HDD to Intel SSD drive. Both laptop users and desktop users can follow this guide. If want to your computer to feel like new, the best way is to upgrade the hard disk drive (HDD) to a solid state drive (SSD). Many users may think it will take a great deal of work for reinstalling system and programs. Luckily, all these efforts can be avoid by using free hard drive cloning software. 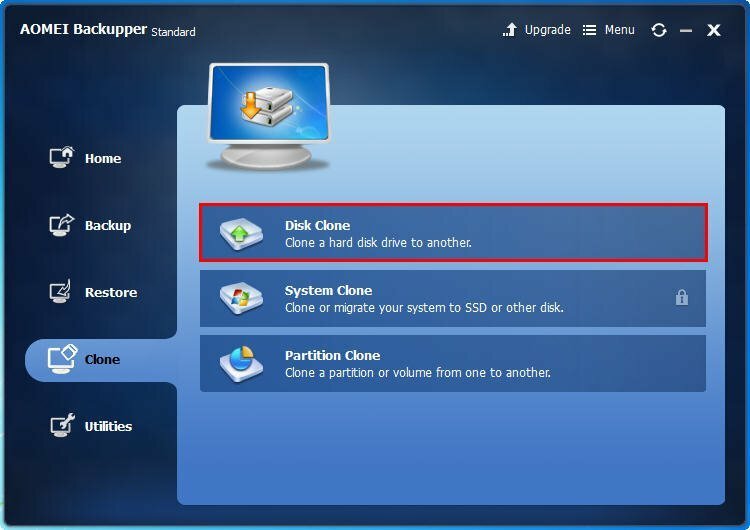 This article will show you how to clone HDD to Intel SSD step by step. As mentioned, you need a good free SSD cloning software. It is key to make the process smooth and make sure the SSD bootable after the clone. Here, AOMEI Backupper Standard is recommended. You can free download it here. You need a power cable and data cable to connect the SSD in your computer. If it is a laptop, then you should prepare a SATA-to-USB adapter to connect the SSD as an external drive. Some laptops have a second drive bay or SSD slot that can also be used to connect your Intel SSD. Apart from Intel SSDs, you can also follow these steps to upgrade to other SSDs like Samsung SSDs, SanDisk SSDs, Crucial SSDs, etc. 1. Connect your Intel SSD to your computer internally or externally. Make sure it is well connected and recognizable. You can open Disk Management to see if it is detected. 2. Open AOMEI Backupper. In the Home screen, Click Clone->Disk Clone. 3. The next screen, it will ask you to select a source disk, which means the original drive that you want to clone. You should also be able to see your SSD here. 4. Then select your Intel SSD as the destination disk and click Next to continue. 5. At the Operation Summary screen, there are three options you need to pay attention to. You should tick the box in front of “Align partition to optimize for SSD” since you want to clone HDD to SSD Intel. Then Click Start Clone to get started. If the SSD is even larger than the source disk, you should click “Edit Partitions on the destination disk” to avoid unallocated space on cloned drive. It is recommended to leave the “Sector by sector clone” unchecked. 6. When the clone is done, shut down the computer and install the SSD in your computer if it is connected as an external drive. 7. Boot your computer into BIOS/EFI and set the cloned Intel SSD as the first boot device, and then reboot your computer. That’s how you can clone HDD to Intel SSD without worrying about reinstalling Windows 10/8/7. If you don’t have an SATA-to-USB adapter, there is a workaround to clone HHD to SSD without adapter.